Located in Okfuskee County, Weleetka is situated ten miles southeast of Okemah, the county seat, and seven miles south of Interstate Highway 40 on U.S. Highway 75 and State Highway 84. In 1899 George F. Clarke of Vinita and Lake Moore of Fairland were both struggling to make a living in the newspaper business. Finding their financial difficulties mutual, they formed a partnership to seek a better opportunity. By that time the St. Louis and San Francisco Railway had begun building a line southward from Sapulpa, Indian Territory, to Denison, Texas. Clarke and Moore learned that the Fort Smith and Western Railway was laying a line westward from Indian Territory to Guthrie, Oklahoma Territory. The partners decided to establish a town at the junction of the two railroads. Clarke, Moore, and John Jacobs of Holdenville purchased land for the townsite from Martha Lowe, a Creek who had received an allotment. The townsite was on a hill on the north side of a horseshoe bend of the North Canadian River. Mrs. Ira Starnes suggested the name Weleetka, a Creek word meaning "running water." On February 10, 1902, the three men started selling lots at forty dollars. Within a day they had made enough money to pay Lowe as well as to recover their expenses. The First Bank of Weleetka opened the next day in a tent. By close of business it held deposits of more than three thousand dollars. A post office was established on March 14, 1902. Weleetka grew rapidly in its early years. It became a shipping point and service center due to the presence of the railroad, oil and gas, and agriculture. Local farmers produced cotton, wheat, oats, alfalfa, fruits, vegetables, peanuts, and pecans. At 1907 statehood the population stood at 1,020. Population peaked at 2,042 in 1930. The town supported two hotels, three cotton gins, a cotton compress, three drug stores, an opera house, and a mercantile company. Beginning in the 1930s cotton production declined, and railroad service was curtailed. Population dropped, and prosperity waned. The number of residents constantly declined during the twentieth century from 1,904 in 1940, 1,548 in 1950, 1,231 in 1960, 1,199 in 1970, 1,195 in 1980, and 1,112 in 1990. At the turn of the twenty-first century the population stood at 1,014, and in 2010 it had declined to 998. Weleetka remained a trade center for the surrounding agricultural area. Ten churches, a school system, and a weekly newspaper, the Weleetkan, served the community. 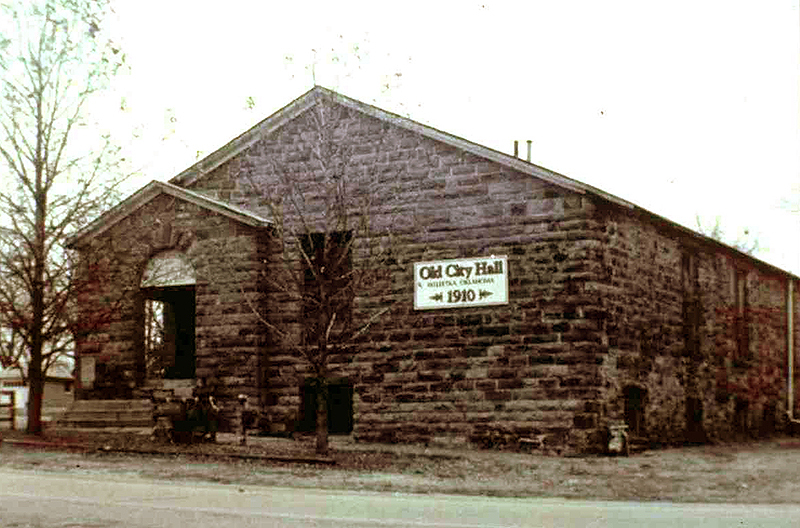 The Weleetka Town Hall and Jail were listed in the National Register of Historic Places (NR 93000156). C. W. Gould, "The City of Running Water," Sturm's Oklahoma Magazine 8 (March 1909). News-Leader (Okemah, Oklahoma), 20 April 1972. Milbria Anglin, "Weleetka," The Encyclopedia of Oklahoma History and Culture, https://www.okhistory.org/publications/enc/entry.php?entry=WE010.